WrapCity Gourmet, a new urban restobar chain, gets an all-digital menu board installed by Mirada Media for its inaugural location in downtown Montréal. 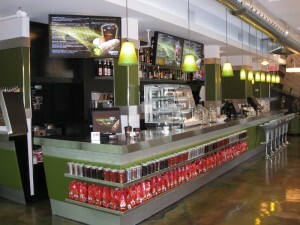 Montréal, Canada – August 25th, 2008 – Mirada Media, a local digital signage integrator, has announced the recent installation of a digital menu board system at Wrapcity Gourmet, located in downtown Montréal. 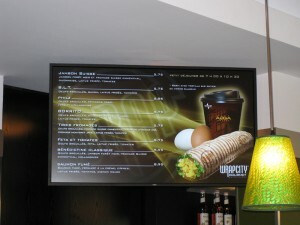 The restaurant was fitted with a three-screen system: two for menus and the last as a promotional board. “We wanted to be trend-setters, not followers,” says Petros Louladakis, one of the Wrapcity Gourmet co-owners. “We saw digital signage in other restaurants across Canada but it wasn’t used for menu boards, only advertising. We realised there was a lot of potential in having the menu boards digital as well,” adds Mr. Louladakis regarding the restauranteur’s reason to go all-digital for their menus. Mirada Media helped the restauranteur realise this potential by providing the consulting, hardware and software needed to run their digital signage. Two of Mirada Media’s ChannelView Players were setup to serve the content to the screens and, in the future, provide advertising space on the restaurant’s flat screen televisions. The menu screens themselves are commercial-grade 46” LCD monitors with slim borders to focus on the content and not give patrons the impression they’re looking at TV’s. Digital menu boards are a relatively new concept for the restaurant industry and, other than some major chains, few restaurants in Canada have any digital signage other than for bathroom advertising, but that could soon change. “I believe we’ll see an upsurge in the adoption of digital menu boards and digital signage in Canadian restaurants now that more businesses in general are using the new medium,” comments Eric Morello, Mirada Media’s Director of Marketing, on the burgeoning national digital signage market. “Restaurant owners are going to start noticing the captive audience networks and digital merchandising that is now prevalent in other hospitality and leisure businesses, like bars and clubs, and realize that the dynamic nature of the media can impact their sales and branding efforts positively”, adds Mr. Morello. The Wrapcity owners understand the potential of dynamic media and it was the major reason why they decided to adopt digital menu boards in their new restaurant. “We wanted to have limitless customization possibilities at our finger tips, the possibility of advertising whatever, whenever we want,” says Mr. Louladakis. 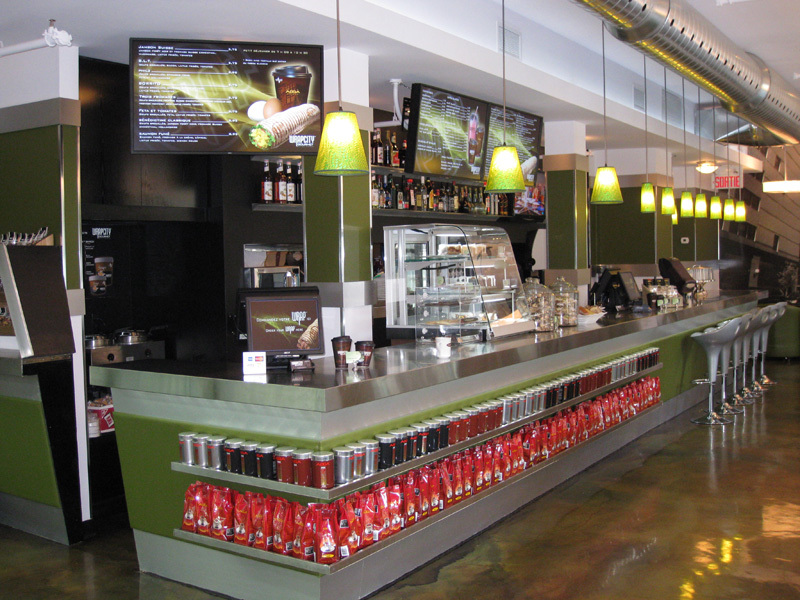 Of the many possibilities, the owners of Wrapcity believe digital menu boards will help increase sales by advertising high-margin and featured products and targeting different promotions depending on the time of day. Day-parting, to allow different breakfast and daytime menus, was another feature only made possible by going digital. Wrapcity can also add, change or remove menu items with relative ease. Via a web interface custom-designed by Mirada Media programmers, restaurant managers can modify items on the fly to test different price points or correct their initial estimates—something that would be almost impossible and very costly with a static menu. These marketing-conscious entrepreneurs have positioned themselves as an upscale restobar, targeting young urban professionals, and are pushing their brand and chic design in everything from their décor to the grill marks on the sandwiches (yes, the wraps are branded!). Getting digital menu boards was an obvious addition in the equation to get that wow-factor they were looking for. “The look is second to none,” say Mr. Louladakis of the restaurant’s digital signage. “They wanted to animate elements of the menu, their logo and feature shots of their fresh ingredients and menu items in their ads. These things add to your patron’s experience, entice them into trying your different offerings and make them remember you,” says Mr. Morello of Wrapcity’s goals. “Our digital signage consultants work hand-in-hand with their designers to get to what works, avoid what doesn’t and make sure their promotional efforts go from the idea stage to the screen quickly and smoothly,” he adds. Menu boards are obviously an essential element of quick serve restaurants and failure can be costly. “Everything from the 24/7-rated screens and media appliances to preventive maintenance schedules have to be carefully picked and setup to assure uptime,” says Mr. Carlo Pansera, Mirada Media’s VP of Operations. Mirada Media’s solutions provide extensive post-purchase services such as monitoring and issue resolution done remotely via the ChannelView digital signage software and technical assistance to make sure their installations are running. Wrapcity is planning to extend their chain of restaurants to two new locations in Laval and the West Island later this year.